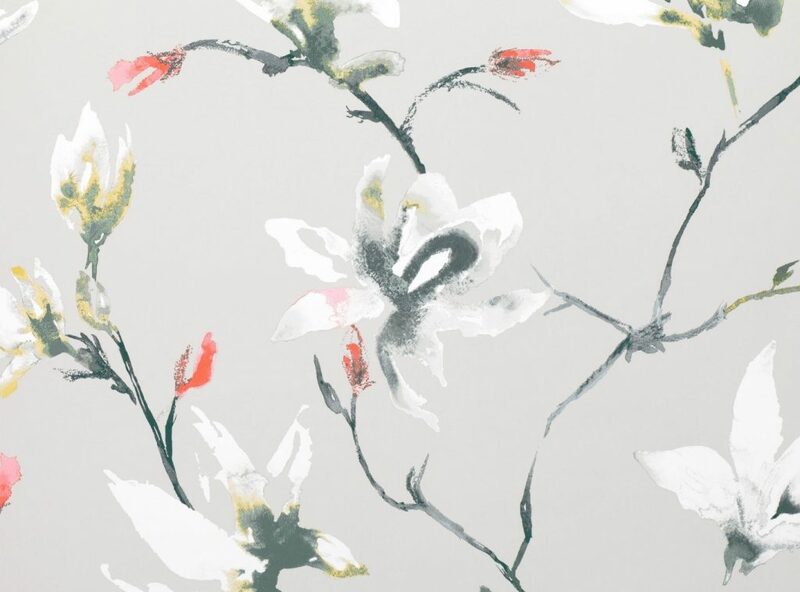 And so how about dressing your wall with a delicate wallpaper from Romo (www.romo.com)? Their new Lomasi wallcoverings include the rather seasonal Saphira wallpaper W405-04, w.68cm, £65.00/roll. “Delicate brushstrokes depict a striking, trailing magnolia in a fusion of gentle pastels and versatile neutrals.” The one shown here includes a flash of rusted orange which, paired with blues and teals, makes a regular appearance in many of the collections this season. Tribal designs and folk art are also key themes and this is evidenced in Villa Nova’s (www.villanova.co.uk) beautiful Aymara collection. 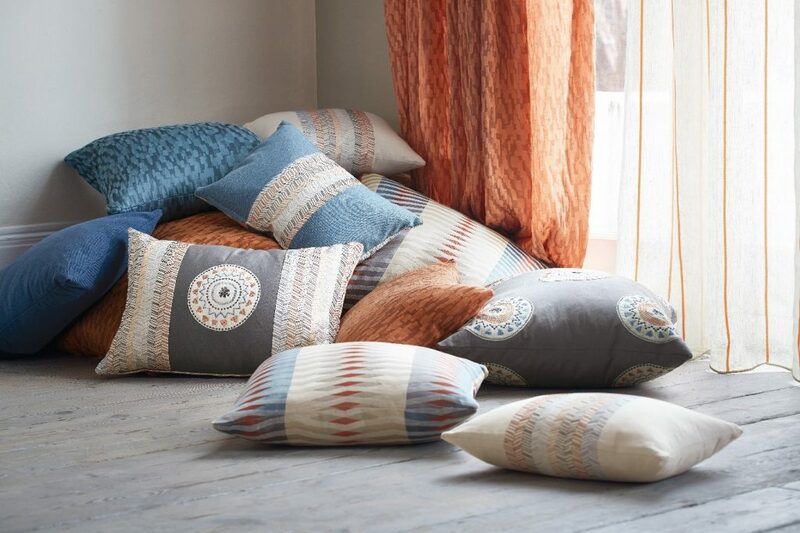 This range of embroideries and decorative weaves range from £50 – £64.00/m and lend a handcrafted feel to cushions and curtains which complement the water-colour nature of the magnolia wallpaper. Available in a variety of blues, greens, neutrals and rusted orange your interiors can be as new as the scene outside your window. 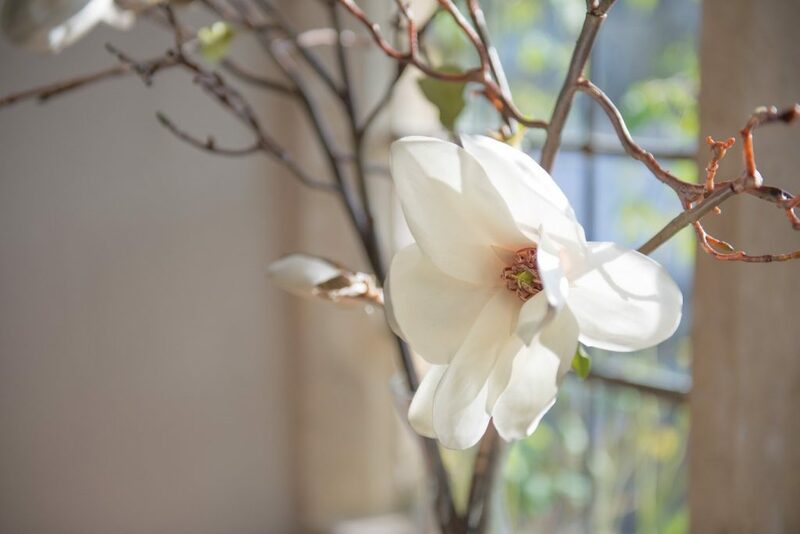 To maintain those Spring blooms for longer than just a few glorious months though try an arrangement of silk flowers. They are so realistic these days and Neptune’s (www.neptune.com) Magnolia Branch in White, w. 320mm D.250mm H.902mm, £14.00 each is a gorgeous bloom. Arrange a few in a carefully curated collection of vases in tones of blue, teal and orange and you will create a floral feature which will enchant and bring cheer long after the Spring flowers have faded.